How can anything written by Manto or about him not be a fascinating read? Or intriguing for that matter? Or also sometimes contemplative, mostly that is? Manto is and will always remain a maverick – no matter how many writers come and go from the subcontinent – or for that matter even from Pakistan. He is in a way, a shared legacy. And it is this legacy that this anthology celebrates (even when berating sometimes) through essays by his friends and enemies (or as the title very tongue-in-cheek tells us). I had been wanting to read this since the time it was announced and I am so glad I finally did. If you love Manto and his works, then this book is a treat. Even if you aren’t acquainted with Manto, then too I suggest you read this book, so you can then read what he wrote. “Manto Saheb” is a collection of essays that also scratches away the writer and shows you the person Manto was – but also it made me think that the writer had to but after all be inspired from the person. Manto’s stories though were never reflective of who he was – maybe given the times he lived in what he wanted to communicate or show through his works. This anthology shows Manto at his candid best, gossipy best, the individual who never believed in taking things the way they were and the one who sometimes also gave up too easily. The facets and shades to Manto so to say are brilliantly revealed, layer by layer in this collection by his friends, family and rivals – from Chughtai to Upendranath Ashk (one of his well-known rivals), to Krishan Chander (his ever-loyal friend), his daughter Nuzhat and even his nephew Hamid Jalal. There is also the opening essay which has been written by Manto about himself – hilarious, witty and as real as it can get. The book gives the reader brilliant insights into the kind of writer he was, constantly seeking validation and attention (even in his personal life for that matter), how he needed alcohol just, so he could momentarily not remember what he was going through and how leaving India and moving to Lahore was perhaps the single-most tragedy of his life. Every essay transports you to the time before and after Partition and makes you want to be there, witnessing what happened in the life and times of Manto. What I love the most about this collection is when people speak of his works – from Hatak to Toba Tek Singh to Boo to also his plays (which are lesser known) and how he worked on them – how he wouldn’t take criticism and how when he was unhappy with the world at large, he became a recluse and just wrote. Also, the translations by Vibha S. Chauhan and Khalid Alvi are spot on – they haven’t compromised at all when it comes to simplifying it for the reader or dumbing it down – it is what it is. Most of the Urdu/Hindi flows effortlessly through English and you don’t feel that you are missing out on something. “Manto-Saheb” is a treat for all literary biography aficionados. The enthusiasm to know more about your favourite writers is never satiated I think. There is always so much more to know and there are of course some books such as these that aim to uncover some aspects of their life and works. A must-read. Also, read it with his short stories, as you go along. The experience is extremely fruitful and rewarding. This entry was posted in 2018 Reads, Anthology, Books, indian translation, Indian Translations, Indian Translations Reading Project, Manto, Saadat Hasan Manto, September 2018 Reads, Speaking Tiger, Translation, Writers on Writers and tagged 2018 Reads, Anthology, essays, indian translation, Indian Translations, Khalid Alvi, Literary Biographies, Literary Nonfiction, Manto, nonfiction, Saadat Hasan Manto, September 2018 Reads, Speaking Tiger, Translation Reading Project, Translations, Vibha S Chauhan, Writers on Writers on September 3, 2018 by thehungryreader. Publisher: Speaking Tiger Publishing Private Ltd. Stories of the Partition of India always leave you heavy. There is a knot in the chest that refuses to leave. Even though you haven’t witnessed any of it, yet the stories have passed from one generation to another. The generation that witnessed and the generations that had to keep the memory alive, even though these memories are perhaps worth not bringing to the fore.And yet there is the question of never forgetting – memory that should remain rock solid when it comes to tragedy and pain and displacement. Homes were lost. Relationships broken. I cannot imagine what it must be like to witness what our ancestors did during that time and yet they did – they survived broken, fractured and somehow still hopeful. “The Unsafe Asylum” is a collection of stories (interlinked) of partition and literally the madness surrounding it. Yes, you will be reminded of Manto but Anirudh Kala has a distinct voice that will make you think and leave you with a lot of emotion. I think this collection also adds a lot of weight only because Anirudh is a psychiatrist and has been studying the long-lasting effects of Partition in both India and Pakistan. This collection starts when the Partition is over, blood has been spilled and people displaced. Even the patients in Mental Hospitals. India got its share of Hindu and Sikh patients and Pakistan, the Muslim ones. This book is about the stories of these patients, their lives before and after the Partition and the long-lasting impact of the catastrophe. At the core of these interconnected stories is Prakash, an Indian psychiatry student who learns of the stories of these patients through one of them, Rulda who was discharged from Lahore’s Mental Hospital. At the same time, Prakash also learns of how he came to be born in 1947, when he visits Lahore. From there, starts another story of the lives of the patients, their stories and how Partition still lingers on, not only in their memory but in everything they do, the way they think and the way they feel. Kala builds characters that stay. Whether it is a young man who believes that Benazir Bhutto loves him to a woman who passes on her delusions of being chased by a mob to her children, or even if it is a doomed love story – all of these are fixed in your head long after you are done with the book. If anything, also beware that the book will play with your head to a large extent. And yet, the experience of reading this book is excellent. Yes, the topic is not palatable. Yes, it will not be easy. But I strongly believe that literature only builds empathy in people. And for that read it all. Read books that make you laugh. The ones that make you cry. The ones that make you smile. The ones that make you uncomfortable and think of what is going on in the world – past, present and what may come in the future. This entry was posted in 2018 Literary Reads Project, 2018 Reads, August 2018 Reads, Books, Indian-Pakistan Partition, Partition, Partition Literature, short stories, Short Stories and Anthologies, Speaking Tiger and tagged 2018 Reads, Anirudh Kala, August 2018 Reads, Cross-Border, independence, India, Manto, pakistan, partition, Speaking Tiger, Stories of Partition and Madness, The Unsafe Asylum on August 10, 2018 by thehungryreader. When an author has had a kind of life which no one can match up to, that is when books such as these are needed. I think to a very large extent, only a few authors can rise to this rank from the plentiful in the literary sea, existing as of now. I have always felt this rare closeness to Ismat Aapa and I do not know why. I think to a very large extent (and I am only guessing here) is the marginalized context – of both of us that I am able to relate to her, the way I do. The bold texture of her life, the choices made against the grain of the norm and more than anything else, to fight for the cause of her work, is something worth admiring, perhaps a hundred thousand times over. Where else can one see this passion today? I may be getting ahead of myself here, but that is only because I love her so. “Ismat: Her Life, Her Times” is a wonderfully constructed book. There is a lot in this book and I can recommend it to any Chughtai lover. Both, Sukrita and Sadique have managed to almost write a canvas of her work and the woman that she was. She is one woman who had so much to say and she always said it with a bite, with humour and emphasizing on the fact of breaking all barriers and boundaries. This book encapsulates her life the way she lived it – from a writer to her advent in the Indian Film Industry to her lens and the way she viewed everything with it. What is even more enchanting is the range of contributors – who have written about her and are collated in this book – from Faiz Ahmad Faiz to Manto to Krishan Chander and Qurratulain Hyder, commenting on Ismat – the person and the writer. 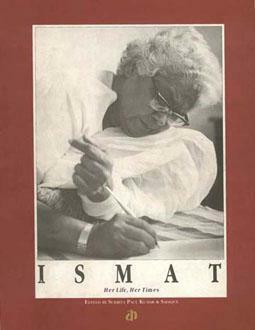 “Ismat: Her Life Her Times” is a dedication to a writer beyond words. It is her life, through pictures, through letters, through her work and the personality she was. The book could be seen as a starter, as a guide to all her works (her vast body of work that is), and to encourage readers to go and read more of her books, her stories and if possible watch the movies she wrote for and acted in. To me this book embodies the woman beautifully. Of course not as beautifully as Kaghazeen Hain Pairan, but it does bring to fore mostly everything about her. A book not to be missed out on. A book which takes the writer beyond everything else and gives her the due and credit she has always deserved. This entry was posted in Authors, Books, Ismat Chughtai, Katha Books, Memories, Review and tagged Bollywood, Hindi, India, Ismat Chughtai, Katha Series, life, Manto, pakistan, partition, translation, Urdu, Works on February 17, 2014 by thehungryreader. Translations are needed – to let us readers know what we have missed out on and what we cannot anymore. I am a champion of translations, only because I wish I could read some works in the language they were written in, but if I cannot do that, then well, a translation suffices any given day. With a book that is translated, there is so much at stake. Are all the emotions translated as well? Are words used the way they are supposed to? Is every phrase and every thought in its place? Maybe so, is punctuation to convey the correct idea? Translation is not easy business. It takes a lot from the translator – it is almost a bond needs to be there between the writer and the translator for sure. 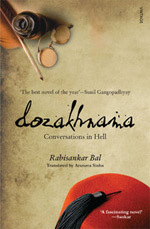 With this, I begin my review of, “Dozakhnama: Conversations in Hell” – written by Rabisankar Bal and beautifully translated by Arunava Sinha. “Dozakhnama” proved to be is a very special read. I read it cover to cover and could not stop reading it. I managed to finish it today and here I am talking about it. The book is about two of my favourite writers conversing beyond the graves – Mirza Ghalib and Sadaat Hasan Manto. Their lives are entwined in shared dreams. The book has all elements – love, anger, hate, jealousy, magic realism (a lot of it and maybe that is one of the reasons I enjoyed the book the way I did), and covers all ground – right from Bandra to Ashok Kumar. This is what I love the most about the book – Bal doesn’t hesitate to imagine and Arunava doesn’t hesitate to work towards getting the emotion right for the reader in English. The writing had me gripped from the first page and I couldn’t put it down, though it was heavy in most places. While reading the book, I often wondered, how it would sound in the language it was written in. The nuances of Bengali may not have come across totally in English; however I must say the translation was packed with power and to the hilt, as it was supposed to. I will not give away the meaning behind the title, because I want other readers to explore what is there to it. At the same time, what I loved most was the couplets and quotes that kept appearing in the book since but obviously it is about two great writers. I have yet to come across a translation as good as this one. Arunava as always does a brilliant job of translating works. Dozakhnama is a read that I will not forget for a very long time to come. In fact, if I have the time to reread it, I will do that as well. I cannot stop raving about it and with good reason. This entry was posted in Books, indian fiction, Literary Fiction, random house, Random House India, Review, Translated Works and tagged arunava sinha, Dozakhnama, Ghalib, literary fiction, Manto, Rabisankar Bal, random house india, translation on February 1, 2013 by thehungryreader.